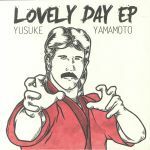 Review: Yusuke Yamamoto is having a "Lovely Day", and so will you be if you pick up this 12". His first release of 2018, Yusuke Yamamoto lands on bubbling new French label Planet Gwer with four charming soulful house workouts. Each one tickling a different corner of the dancefloor's underbelly; the title track is a timeless Fingers-level walk through the park, laden with a sensual vocal hook and 20 summer's worth of feelgood and "Routine" is a slightly darker garage-inspired jam that sits somewhere between Kerri Chandler and Silicone Soul. Elsewhere "Take A Walk" struts with a little mid 90s Euro charm, all synth flares and positivity, while "Patching" jacks with a chunky, smoky twang that wouldn't go amiss on Robsoul. Lovely.